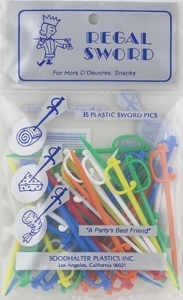 Brighten up barbeques and parties with colorful mini plastic swords. These plastic sword picks are 3 long. Also, they are in an assortment of colors: blue, yellow, red, green, white and orange. Party Tip: Use for fruit, cheese, or appetizers.